it is one of those catholic churches, so I would burst into flames going inside. I went inside in 1970. I'm still here. that was then, this is now. a wood roof and the rose windows can hopefully be replaced. the architecture was not destroyed due to the stone construction. it's a symbol of paris as much as the eiffel tower is. and I agree with 710 - WTF? yeah, riiiiight. I first 'discovered' Paris in 1984 and it immediately became my favourite of all the cities in Europe which I knew. For 10 years from then I'd go for a week three times a year, at Easter, at their annual 14 Juillet celebrations and, for good measure, a random week in November. 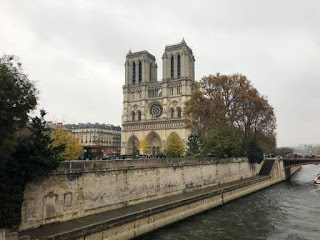 My cheap and clean small, gay-friendly hotel wasn't far from Notre Dame and every night after cruising the bars, discos (and other 'places') - terrific gay scene it had - to get back to the hotel I'd have to walk past the looming dual towers of the Cathedral at around 4 or 5 a.m. Those were the days. I haven't had the chance to return to Paris since the early 90s but although I'm now too old to sample fully the delights it then had to offer I still like to thank that despite inevitable changes, even today it might remain top off my league. As for that 'crown of thorns' - obviously a myth created for the gullible masses (no pun intended) - when I lived in Cologne my flat wasn't far from their own cathedral (still the largest Gothic such in the whole of Europe, in terms of dimensions) boasted owning the tombs of the Three Kings or Magi - when in fact the Bible makes no mention of the number, only of three gifts. This latter and the Notre Dame claim to have the original authentic 'crown of thorns' are, of course, each as preposterous as the other. Adds to the 'romance' of the places, though. I'm glad you wrote this, in a respectful way, as I was feeling the same but didn't know how to express it.